Literature on consumer ethics tends to focus on issues within the public sphere, such as the environment, and treats other drivers of consumption decisions, such as family, as non-moral concerns. Consequently, an attitude–behaviour gap is viewed as a straightforward failure by consumers to act ethically. We argue that this is based upon a view of consumer behaviour as linear and unproblematic, and an approach to moral reasoning, arising from a stereotypically masculine understanding of morality, which foregrounds abstract principles. By demonstrating the importance of context to consumption decisions and articulating the impact of caring relationships, we highlight how such decisions are both complex and situated. This is particularly evident for decisions involving the needs of others, as occurs in family life. 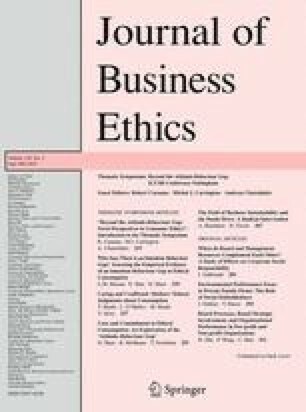 We argue that the incorporation of care ethics provides both theoretical insights and a more complete account of consumer ethics. This is explored empirically through an investigation of the ethical dilemmas arising from consumption decisions made by mothers of young children. Such decisions juxtapose an ethical consumption orientation (representing impartial concerns) with care for one’s child. Therefore, what has been previously considered a failure to act ethically may in fact be the outcome of complex decision making, which involves competing ethical considerations. We discuss the implications of our findings for theory and practice and how this approach to consumer ethics could be applied more widely.